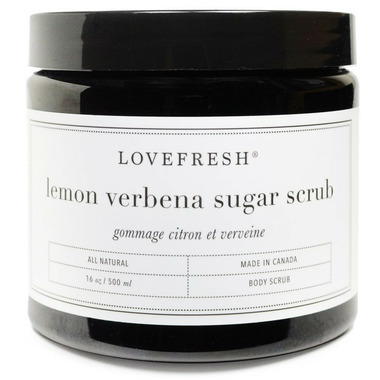 Lovefresh Lemon Verbena Sugar Scrub is a hydrating sugar scrub that is gentle enough to use daily. Exfoliating with sugar increases circulation, stimulates the lymphatic system (which moves toxins out of the body), makes your skin glow, and even helps tone and firm your body. Start with your feet and move up in a light, circular motion. Your skin will be left feeling soft and smooth. This is my 2nd Lovefresh product. They are a bit pricey, but really good quality. This scrub is mild enough to use even at dry winter months, but does a good job. My skin feels soft and silky, no need to put cream on it. This scrub smells wonderful, the grains are small and dissolve into the skin. I love how smooth my skin feels after I use it. The only reason I took off a star is because it does feel slightly greasy at first, but it goes away pretty quickly.